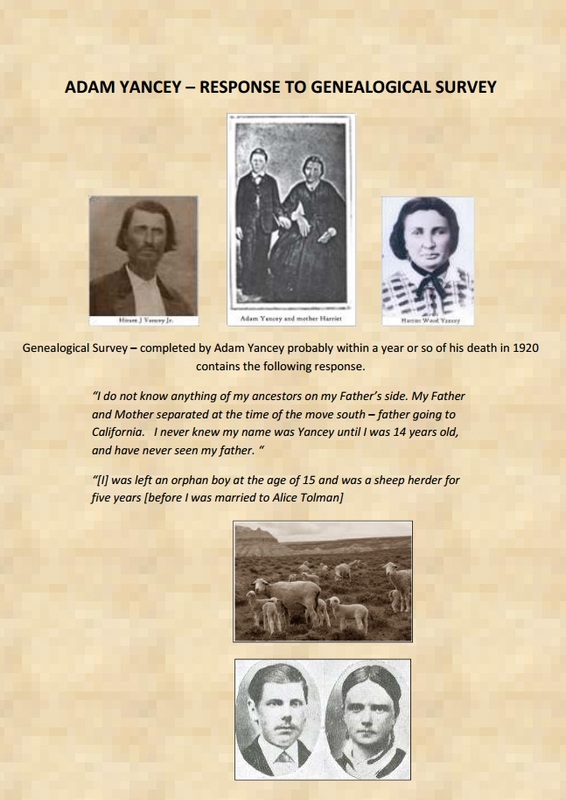 Some time back I shared with many of you a church genealogical survey response by Adam Yancey probably a few years before he died. (above) In it he stated he didn't even know he was a Yancey until about age 14. I had always known that he never knew his father - but this was the first time I came to understand that he really didn't even know he was a Yancey in his youth. Since then various related pieces of the genealogical puzzle have fell into place. Many researchers have recorded the first US census upon which Adam Yancey appears as the 1880 census. But why not the 1860 & 1870 census??? Then it donned on me . . that he must not be recorded under the name Yancey. 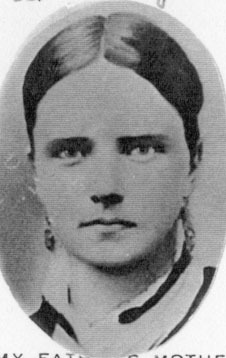 I began to look for his mother on the census - - I knew that Harriet at this time had remarried Capt James Brown of Ogden. And so I looked for the Brown Family - and low and behold - there is Adam's mother Harriett - and there is Adam - under the name of Adam W. Brown. I had sometimes read of accounts that Adam Yancey was teased about his parentage when he was young. And now it made a bit more sense. At some point, one wonders if it was on the death-bed of Harriett Yancey, that she told her son Adam of his Father - and he began using the name Yancey. And how he may have been teased about the questions of who his father was. Adam's mother died when he was about 14. He acquired a job as a sheep herder at some point and interestingly one can also find his name recorded on Cattle Brand registries of early Utah. In the above census Harriet is living with her second husband James Brown - a founder of Ogden, Utah. Her son Adam is recorded under the name Adam W. Brown. 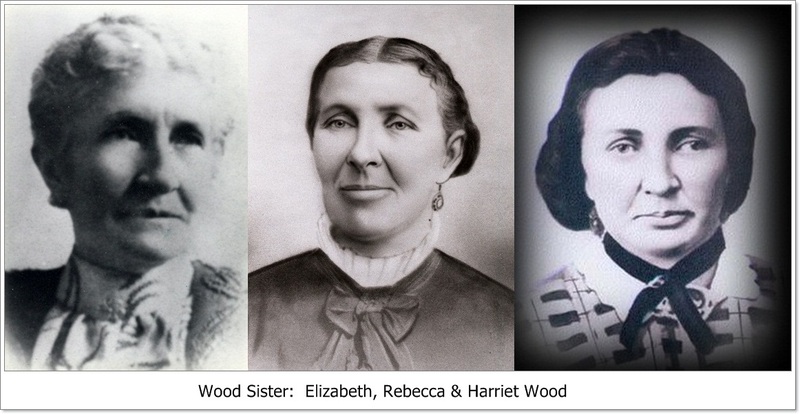 Adam's father Hiram had left his mother Harriett - about 1858 - at about the time of the "Utah War" and Johnston's Army - what Adam referred to as "the great move south"
On this census schedule - in the Daniel Wood home - are recorded three of his daughters - Rebecca, Harriet & Elizabeth. Rebecca was an ancestor of my mother, Harriett was an ancestor of my Father and Elizabeth was the mother of the well known James Henry Moyle - who group up as a cousin and playmate of Adam Yancey. The fact that the three daughters are recorded on the census schedule is unusual as they would have been married and had their own families at different locations. Harriet's son Adam is not found listed in the household and has not yet been found on any other 1870 census record. For a few years between 1870 and 1880 Adam worked as a sheepherder - possibly in remote regions of the Utah valley. This is the first census after Adam Yancey had married Alice Tolman had married in the endowment house in Salt Lake City. Here is a copy of a page from their family Bible. Note that they are living next to some of of the Wood Relatives. Family records state they lived in a two room rock house on the Wood Property. Adam Yancey's occupation is given as a Carpenter. Some time after 1880 - they were part of a group of LDS families called to settle a community in Idaho that came to be known as Chesterfield. 1900 Census - Chesterfield, Bannock Co., Idaho. Here in Chesterfield Adam and Alice are shown with eight of their children Among their children - Adam A. Yancey & Mary were buried in the Chesterfield burial grounds. The family milked cows and produced milk and butter for the community. 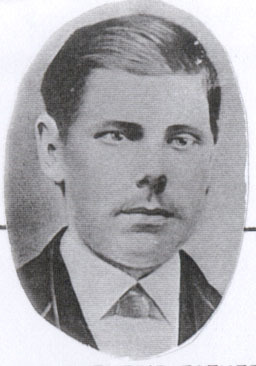 In 1895 Adam was called on a church mission to Texas - he returned in very poor health. Soon thereafter they would move to a more hospitable region near Blackfoot, Idaho. Adam at this time was serving as the Bishop of the Groveland ward. And by this time he had built the two story brick house of Groveland. The family seemed to be doing well financially. In the years ahead - Cyrus and Daniel would be called to serve in World War II. note by this time the older children (James & Orval) had married - and lived in homes they built themselves close to the Adam Yancey residence . the family are recorded as "farmers"
In this census - Cyrus and Daniel have come back from the war and are living with Adam and Alice - both suffered from health issues that brought earlier than normal death. most of the older children had married and moved off. By this time Adam has lost his eye sight and was blind. But he did much around the home with this very limited vision - putting up the picket fence that we see in the old photos. The home site had farm land and groves of fruit trees - with a canal running south of the property for irrigation. Adam would have been released as bishop buy this time. Son, Orley was about to leave on his mission to the Southern States. Some time between 1910 and 1920 Adam made contact with his long lost brother John from Independence, Missouri. At some point John came to live with Adam in Groveland. Soon after this census was taken Adam would pass on from a heart condition and was buried in the Groveland cemetery. In 1922 his brother John died in Groveland and the two are buried next to each other - after having not known each other most of their lives. Alice shows as a widow on this census with Daniel, William and adopted Ruth as the children at home. William had just returned from his mission to Great Britain. Next door was son Orley with wife Elda and his two oldest children. Orley is recorded as a Truck Driver. These were the tough time of the Great Depression. Money was scarce. Much of the Adam Yancey land was sold off in lots North of the house. Alice often rented rooms for income. 1940 Census - Groveland, Bingham Co., Idaho. This is the last census where Alice would be recorded. Son Daniel who lived with her all his life - had died in 1939. Next door was still Orley Yancey and his family of now 4 children - farming. Alice died in 1943 from old age along with the effects of diabetes. At some point the Adam Yancey house was sold off to non family. But Orley & Elda Yancey continued to live their entire lives in the close area - where descendants still live today.